We, the undersigned, hereby establish the Missouri Community College Athletics Conference. Purpose. It is the purpose of the Conference to promote and to develop wholesome participation in a full range of intercollegiate athletic activities for men and women. Membership. Membership in the Missouri Community College Athletics Conference is contingent upon membership in the National Junior College Athletic Association. A community college may apply for membership in the Missouri Community College Athletic Conference by submitting a request at least four weeks prior to the winter meeting of the Conference Officers and Board of Directors. Membership in the Conference is obtained by the ratification of a majority of the Conference schools. III. Governance. The conference will be governed by a Board of Directors and Officers. The Officers will consist of the Athletics Directors and/or designated representative of each member school. Each member school shall have one vote. The Board of Directors shall be appointed by officers and hold terms as deemed fit by the current officers. 1) The Board of shall oversee and approve financial transactions and review annual report/financial statements of the conference. 2) The Board of Directors will review and approve By-Law changes. The officers shall be the President, Vice President, Secretary, and Treasurer. Election of officers will be held every third year at the fall meeting. Each of the four offices shall be held by an Athletic Director. The term of office for all elected officials shall be three years from the date of election. The election shall occur with nominations and votes by athletic directors from member institutions. A voting ballot shall be used to make sure all voting remains confidential and recorded by the conference secretary and one non-officer member. If any officer cannot complete his/her duties, a member shall be elected at the next meeting to fill the office. The Vice President will fulfill the duties of President. The President shall be paid a $750 annual stipend starting the 2018-19 Academic year. Shall call and preside at all meetings of the Conference and fill other customary obligations of the office. Shall serve as a resource person in matters related to questions of eligibility and/or problems related to ethical practices by member schools and staff. Shall receive protests and grievances and establish procedures for adjudication. Shall initiate written communication with chief executive officers of member schools in matters of rule violations specific to the use of drugs, alcohol, and tobacco. In concert with the Board of Directors, shall establish the award system for Conference championships..
Shall preside over meetings in the absence of the President. Shall complete the unexpired term of the President, if such should become necessary. Shall keep and distribute minutes of all meetings. Shall update and maintain the constitution and by-laws. Shall distribute conference “Sportsmanship Award” in each individual sport. Shall keep fiscal records of the organization. Shall receive and disburse conference funds. Shall fill other customary obligations of the office. Shall secure and disburse Conference plaques, trophies, medals, and other awards. Terms of Office. The terms of office for all elected officials shall be three years from the date of election. If any officer can not complete his/her term of office, a member shall be elected at the next meeting to fill the office. The Vice-President will fulfill the duties of the President. Dues. Financial management related to Conference activities is the responsibility of the Treasurer. Receipts take the form of annual dues and special assessments. Disbursements are primarily for purchase and dissemination of awards. Annual dues are assessed at $450.00 and are payable by September 1st. When disbursements exceed either receipts or checking account balance, member schools will be assessed a pro rata share of the anticipated costs. Men’s Sports: Basketball, Baseball, and Soccer. Additional Sports: Competition in additional sports necessitates participation by four (4) member schools. Declaration of intent to participate and approval of a sport are part of the business conducted at the annual winter meeting. VIII. Amendments to the Constitution. This Constitution and By-Laws may be amended if the amendment is requested four (4) weeks prior to a scheduled Conference meeting and if it receives a favorable vote by two-thirds of the Conference schools. Amendment 1– Member schools wishing to leave the conference will be required to give one calendar year notice of leaving the conference. Penalty for leaving the conference will be an assessment of the following year’s dues as an assessment fee. ex. $450 membership fee will be paid to the conference. 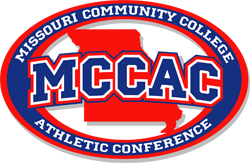 The Missouri Community College Athletics Conference (MCCAC) uses the official rulebooks published by the NCAA and follows regulations established by the NJCAA for its member schools. The Conference develops sport codes that govern procedures specific to each sport in which Conference championships are competed. schedule will be the primary reference in case of questions or discrepancies on times, dates, etc. (See attachments for master schedules and rotation guidelines). In all Conference sports, institutions will play teams within their division two dates and teams out of their division one date. Baseball will play all conference institutions both home and away. Soccer will play each opponent once. Men’s basketball will play like teams division teams twice and one time against other divisions. If opposite division teams play, the first game in men’s basketball will count as the conference game. All results from all contests (DI/DII playing twice exception) will be calculated into conference standings. This by-law amendment will be revisited bi-annually in even years. Conference championships will be determined by the best winning percentage if teams play a different number of games. Failure to play a scheduled Conference game will result in a loss for each scheduled game. Teams will be required to play the full conference schedule in order to win the championship. All make-up dates must take place before the start of Regional Championships. Note: In extreme circumstances, this rule may be waived by a vote of the President, Vice President, and Secretary. Institutions do not have the option to count one game twice in the standings unless approved by Athletic Directors. to initiate the resolution of disputes immediately. When it is brought to the attention of a coach or Athletic Director that a player or coach has in his/her possession or is consuming alcohol, drugs or tobacco on the playing premises of any Conference athletic contest, a written report of the incident will be sent to the Conference President. The President will, in turn, submit a letter to the President or Chief Executive Office of that college with copy to the Athletic Director of that institution. In the event of a tie for a team or individual championship, all teams or individuals tying for thechampionship will receive awards. During the NJCAA probationary period for violations neither any individual athlete involved in the violaton, nor the team(s) certified through the NJCAA electronic database in the subsequent(s) shall be eligible for MCCAC awards or honors. All conference teams – details are described within each sport code. conducting voting for post-season awards. outfielders, two pitchers, and one designated hitter. (one per institution). This individual must have been previously nominated. Coaches may not vote for their own student-athletes. A ” Sportsmanship Award” will be presented in each sport as voted by the coaches and distributed by the conference secretary. Harold Oetting MCCAC Academic All-Sports Award. 1.) Include academic information for those athletes who participate in conference sports. a letter grade of F was issued. W’s are not to be included. 3.) ALL developmental hours, as well as ALL college credit level courses are included. will be the equivalent of 2.0. b.) For non-developmental courses a grade of P is counted as 2.0. 4.) This information is not calculated on best hours, but on all hours attempted.